Back to Keith Floyd. It is probably no great exaggeration to say that without having seen him on television I would not be doing all the cooking I do. It was his series on Spain that did it for me. You could carp and say that most of what he was cooking were one pot wonders and there was no finesse in what he was doing. But that misses the point. It was about food kept simple, but good because the ingredients were fresh and treated with respect. There was all that and he was filming in Spain. Apart from half a day lost in Barcelona and a couple of holidays in Menorca I had not been to Spain. The bits that we saw made an impression, particularly the shots of a fiesta and men walking along calmly holding fireworks and lighting them in their hand and letting them go just as the wick caught. So I will go down now and open a good bottle of red wine to slurp with the beef stew. It has been cooking for about four hours. All it needs now is for me to put in a few handfuls to heat through to give it some sweetness. As might be expected two children are already complaining at the prospect of stew again. The rest of us will enjoy it. If you want to bring some excitement into your Saturday morning can I suggest parking your car on a hill in Birkenhead and forget to put on the handbrake. That way you can get out of the car, close the door, walk round to the boot and open it just as the car starts to roll down the hill. Then you can try hold the car back by hanging on grimly to the handle for the boot and find out that actually cars are heavy once they start moving and don’t take kindle to being held back. You can look stupid for a moment. Then you can run back round to the door and try open it as the car starts to roll with a bit more speed. You can be thankful that the handbrakes works by way of a switch to the right of the steering wheel and if you have time you can try and remember if you push or pull the bloody thing. The open car door can clatter noisily against a sign on the pavement just as the car comes to a stop. Got me going that did! No damage done. Must have been fun to watch though. Lunch has been a carefully constructed chicken sub. Two split chicken breasts flattened and put to fry in hot oil with salt, pepper and hot paprika. Whilst they fried I split the bread and sliced up a tomatoes and onion. It was then put together and cut in half. My half had an extra doze of chilli sauce. Supper this evening is a beef stew, with garlic and prawns. It comes from Keith Floyd’s book Floyd on Spain. It is probably one of my oldest cookbooks although it has not been off the shelf for a few years. Most people will take an old video to be put on DVD so as to preserve their wedding video or perhaps a christening. I did it so that I can have the very old TV series, Floyd on Spain, available for all time. If I understood the technology I could put some of it on here. Almost midnight on a Friday evening and I have a glass of red wine in front of me and the prospect of the one and only son plus four or five of his mates arriving home any time soon from a party.They drank all the spare cans of cider they could find in the basement before they went out when they were filled with promises of good behaviour. They are meant to be up early tomorrow morning for rugby. We shall see. In the meantime I have eaten a plate of lamb chops with mograbiah. They were very good. I think it is going to be a weekend of sustaining stews. That’ll be between raking up the rest of the leaves in the garden and mulling over the secret santa to come. Clancy had his finger in the air, elbow on the table in front of him and was laughing through his teeth, his face red with whatever it was had got him going and the sound coming out wet with drink. The mackerel man, Jack Mackerel, he came back with his family the following year and stayed at the same cottage with its boat. Tom Cronin had the cottage and he set the boat up before he came and he had a small engine on the back of it then and made sure there were a couple of new lines, hooks and weights, ready tied in the garage. He may have seasoned them but I’m not sure he told the man that. The second year we got a name for him, a proper name, the one that his wife used, but we didn’t bother with it and when he came in here we still called him Jack and laughed with him for being a fecked fool with the mackerel. He was more relaxed when he arrived here for his two weeks. He’d started a beard before he got here and all he seemed to wear was an old pink shirt and a pair of rough blue trousers no matter the weather. His wife and their children seemed happy to stay hereabouts and they didn’t bother to go driving off to a beach twenty miles away. The second year coming back they had gotten more comfortable with the place. 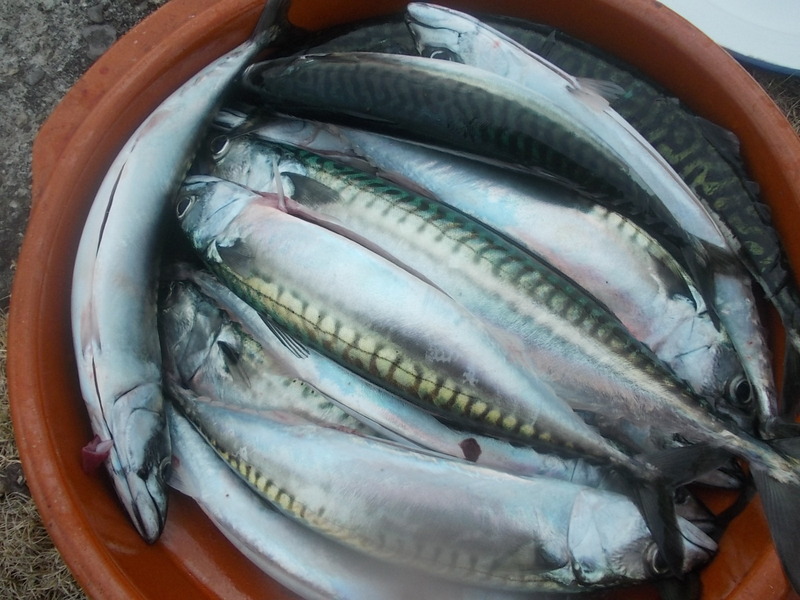 But the man still wanted his mackerel and after two days here he was out again in his boat to try and get some. With the engine he didn’t have to go so long as he could get past the island in a few minutes and there was no need to use the oars. This time he had a better idea of where to go and the time to be out there and he would park the boat out there fifty yards or so off the island, there in the channel and put over his line in the late afternoon on the rising tide. He did that for three days straight and we watched him out there and he caught nothing. As each day went he stayed out there another hour or so longer as if sufficient time would have him pulling in the fish but there was feck that he caught on those new lines. He came here when he’d finish and as those three days went by his shoulders started to slope down and he lost some of the relaxation he had on him that first day he arrived. After that third day he came in here in the early evening. He had his family with him and they took a seat in the corner there and it was if they were waiting for him to catch his fish before they could move up here to be closer the bar. I’d a bag of fish I had caught that afternoon under my chair. I had been up further along the bay in Paddy’s boat there and we had caught a bucketful in less than twenty minutes. He protested and said they had eaten already and there was food where they were and he couldn’t take them from. I reached down into the bag and pulled out one of the fish. It was still bright from the water. It was a big fish, more than twelve inches long and I could feel its hard fat belly under my fingers. I took out a knife from my pocket and cut a line up its belly. I spilled the guts out into the bag by feet and then eased out of the pouch two fat creamy glands. I pushed the two glands back into the belly of the fish. The man’s pint was on the bar and he took a long drink at it. I wiped down my fingers on my trousers and gave him the fish in a bag along with another. He took the bag and went to sit with his family and I watched as his shoulders eased up. Clancy had his finger down now but he was still laughing quietly through his teeth.